Brothers Complete is now in its fifth year of making dog food after operating a pet food store for over 10 years. According to the company owners, during this time they took careful notice of the effects of different high end foods on thousands of dogs. They developed their own ideas about how to make a super premium dog food. Brothers Complete makes four dog food formulas – three allergy formulas and another formula. They also have a sampler pack and lots of different treats available, as well as dehydrated sweet potatoes. They use no grain or potatoes in their food, make their food in small batches, and they use no BHA, BHT, or ethoxyquin. Brothers Complete is a family-owned and operated company with headquarters in Fort Lauderdale, Florida. Who Manufactures Brothers Dog Food? According to Richard Darlington, CO-CEO of Brothers, Brothers Complete dog food is currently made by CJ Foods. “Brothers used to be made at the Hamlin, Texas plant early on but when Great Life purchased the plant we moved the manufacturing to HiTek in Georgia. Finally in 2014 we earned an invitation to submit our formulas for consideration by CJ Foods who has plants in Bern, Kansas and Pawnee, Nebraska. They were our ultimate goal because they are widely considered by industry insiders to be the best co-packer of high end dog foods. “They put us through a 6 month vetting process that was quite rigorous, time consuming, and thorough and has left me with no doubt whatsoever that I can rely on them 100% to produce our product faithfully to the exact specifications we give them and with the high quality ingredients that we stipulate. Marisa and I went to personally tour the Bern plant as well as the newer plant that we are being produced at in Pawnee, Nebraska. It’s very impressive and it’s immaculate and designed to be kept that way. According to Brothers, their food is made in small batches and placed in their warehouse at 60 degrees within two days of manufacture, ready to be shipped to retailers. This helps preserves the food’s freshness. We did not find any recalls for Brothers Complete dog foods on the FDA recall list or online. Check Chewy.com and other online pet food sites for discounts on their foods. You can visit the Brothers Facebook page to stay advised of upcoming specials and new products. Brothers is also on Pinterest and Google+. Brothers Complete is an ultra premium dog food that is GMO-free, grain free, sugar-free, hormone-free, antibiotic-free, free of white potatoes, free of sweet potatoes, free of artificial coloring, flavoring, and chemical preservatives (BHA, BHT, ethoxyquin). In other words, Brothers does not contain the ingredients that you are normally encouraged to avoid in dog food. Their foods are made in the United States. They are formulated for all life stages and they include digestive enzymes. They use protein from free range sources. They use selective prebiotics and the highest grade protein, per the company. They use encapsulated probiotics. And, according to Brothers, over 90 percent of the protein used in their food is animal-sourced protein – not from plant sources as we see so often in dog foods today. We’ve already mentioned that Brothers began by selling some of the best dog foods available and observing the results. They noticed that even dogs eating good quality dog foods continued to have many health problems and they thought they could make better, healthier dog food. You can read more about how Brothers expanded to develop their own dog food and their critique of the AAFCO feeding trials on their web site. Note that we agree with most of Brothers’ assessment of the AAFCO feeding trials and their other comments about AAFCO. However, we consider AAFCO standards the best we have for most dog foods at this time. Some foods, like Brothers, obviously far exceed these standards, but without these minimal standards some lower quality dog foods might be even worse than they currently are. Brothers dog foods currently include the following formulas. Nutritionally complete and balanced, Brothers Complete® Turkey & Egg is formulated to meet the nutritional levels established by the AAFCO Dog Food Nutrient Profiles for all life stages. * Please note that this is the actual statement on the Brothers Complete web site. It does say “turkey” and not lamb for this food. We assume this is just a typo. 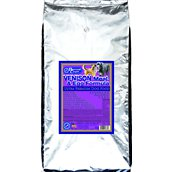 Nutritionally complete and balanced, Brothers Complete® Venison & Egg is formulated to meet the nutritional levels established by the AAFCO Dog Food Nutrient Profiles for all life stages. As you can see, the Brothers Complete dog foods use human grade proteins and most ingredients are sourced from the United States. Brothers says that they do source venison and lamb from Australia and New Zealand. This is not unusual for many dog food companies. Cassava root (for tapioca) is also imported because it is not grown in the U.S. Their foods are high in protein and most of the protein comes from animal sources. Fat in the foods is considered moderate by current standards. The foods are low in carbs with no carbs from grains or potatoes/sweet potatoes. Brothers is particularly mindful of leaky gut and allergy conditions. Three of their four dog foods are marked “Advanced Allergy Care” but the company states that these are not limited ingredient diets. 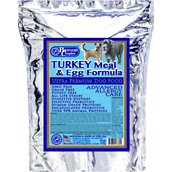 All of their foods use multiple sources of protein, including eggs which can be an allergen for some dogs. Brothers Complete pays special attention to several ingredients in their foods – enzymes, probiotics, and prebiotics. Many companies add these ingredients but not the kinds that Brothers Complete uses. These ingredients are all important to help dogs better digest food. In nature these ingredients would mostly be found in the animals that dogs/wolves ate but our dogs can’t depend on those sources. 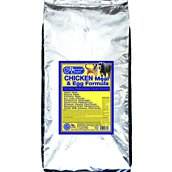 We supply them in the dog food we feed, in fresh food, or in supplements instead. Enzymes are all the rage right now. You can read this (lengthy) piece from Dr. Karen Becker on the Mercola site for more information about them. The main digestive enzymes for dogs are Protease – helps break down and digest protein; Amylase – helps break down and digest carbohydrates and starches; Lipase – helps break down and digest fat; and Cellulase – helps break down fiber. All of these enzymes are present in the Brothers formulas, along with Hemicellulase which is the collective term for the group of enzymes that break down hemicellulose. Hemicellulose is found in the cell walls of plants. Dogs have a hard time breaking down this plant material as you probably know if you have fed your dog a raw diet or cooked for your dog. Most plant material such as vegetables have to be pureed or cooked slightly in order to help a dog digest it. Hemicellulase can help dogs digest this plant matter. The foods also contain encapsulated probiotics which is unusual in dog foods at the moment — (dried Enterococcus Faecium, Lactobacillus Acidophilus and Lactobacillus Casei fermentration products). This is a new approach to adding probiotics to pet food or to any foods. One of the problems with adding probiotics to food, in general, is trying to make sure the microorganisms remain viable. Encapsulating the probiotics may be a better way to make sure the microorganisms successfully reach the gastrointestinal tract. The prebiotic in the food is organic, long chain Inulin. Inulin is a soluble fiber that is literally found in thousands of plants. It’s often included in dog foods to encourage the growth of beneficial bacteria in the gut. We often see it added to dog food from chicory root. All four dog foods are moderately high in calories. How Would You Rate Brother’s Complete? Brothers Complete Lamb Meal & Egg Formula with Advanced Allergy Care is labeled an “ultra premium” dog food and we have no problem with this designation. Technically there are no guidelines about calling pet foods premium, super premium, and so on – these are marketing terms — but this is a very good quality food. The first five ingredients in this food are: Lamb meal, Whole Eggs dried, Turkey meal, cassava/tapioca, and peas. According to Brothers, 90 percent of the protein in their foods come from animal sources and we do see three animal sources of protein in the first three ingredients. 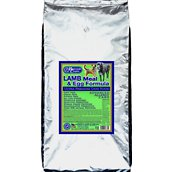 Most canine nutritionists agree that named meat meals, such as lamb meal, are as good as whole meats. Meals have had most of the moisture and fat removed so what remains is very high in protein. Lamb is typically 59 percent protein, 36 percent fat, and 5 percent carbohydrates. You can expect lamb meal to have a higher concentration of protein than whole lamb. Lamb is also a good source of Vitamin B6, Pantothenic Acid, Phosphorus and Manganese, and a very good source of Vitamin A, Riboflavin, Niacin, Vitamin B12, Iron, Zinc, Copper and Selenium. As Brothers notes on their web site, eggs contain all 22 amino acids and they are easily absorbed. They are also completely bioavailable meaning that the body can use them completely. Whole eggs – another source of animal protein – are made up of 35 percent protein, 63 percent fat, and 2 percent carbohydrates. They are also a good source of Riboflavin, Vitamin B12 and Phosphorus, and a very good source of Selenium. The third ingredient, and the third animal protein, in this food is turkey meal. Turkey is usually low in fat and high in protein. It’s also a good source of iron, zinc, phosphorus, potassium and B vitamins. While Americans often associate turkey with very fattening meals because of feasts like Thanksgiving, it’s actually a very healthy and nutritious meat. As with other meals, turkey meal has had most of the moisture and fat removed so it should be higher in protein than whole turkey. The fourth ingredient listed is cassava/tapioca. As Brothers explains on their page, cassava, which is used to make tapioca, is used as a binder in the food. Dog food is made into something like a batter. Like most cookies, cakes, and breads, it requires a binder substance to hold the ingredients together. This is usually some kind of starch. When grains and potatoes are not used (and Brothers does not use these ingredients), it’s necessary to find another source to act as a binder. Tapioca is a low glycemic starch. It does not provide many nutrients but it serves its purpose of holding the other ingredients together. This may be true. We haven’t seen the studies so it’s hard to comment on them. You can read more about cassava uses and processing here. The fifth ingredient listed is peas. AAFCO doesn’t have a definition for peas in dog food but it usually refers to field peas or yellow or green split peas. Peas have about 22 percent protein, 76 percent carbs, and 2 percent fat. They are a good source of Vitamin A, Riboflavin, Niacin, Vitamin B6, Folate, Magnesium, Phosphorus and Copper, and a very good source of Vitamin C, Vitamin K, Thiamin and Manganese. They are a plant source of protein and some dog food companies tend to over-use them as a substitute for meat protein, along with lentils and other plant proteins. They have replaced corn for some dog food companies. However, since they are the fifth ingredient in this food we would not expect them to be replacing meat protein. Most of the protein in the food is likely found in the first several ingredients. Other ingredients of interest in the food include chicken fat – a good, named fat; whole cell algae dried – a pure source of omega-3 DHA. Algae is being used more and more by dog food companies lately as a marine source of omega-3 fatty acids. The food also contains natural preservatives – Mixed Tocopherals (a source of Vitamin E), Rosemary extract, and Green tea extract. Brothers Complete products are preserved naturally with a combination of mixed tocopherals (Vitamin E). Rosemary extract, and green tea extract. Because Vitamin E is light and heat sensitive, we package our food in light-proof foil and keep it in a dark, air-conditioned storage facility at 60 F until the day it is shipped to you, to maintain the effectiveness of the natural preservatives we use. Most dog foods can spend 3 to 6 months or longer, in hot warehouses before reaching the retail outlets. Then they can sit on shelves in pet food stores for several more months before being purchased by the customer. Brothers Complete is manufactured in small batches and one day after our food is made it is put in a dark, air-conditioned storage facility and kept at 60 F to maintain maximum freshness and nutritional bioavailability. We like dog foods made by both big and small companies but this is one area where smaller companies like Brothers Complete really have an advantage over big companies. When you buy their food you know you are buying food that was made in a small batch and it is fresh. The ingredients are fresher and in some cases that can really make a difference to your dog. That’s something to consider when you are choosing a dog food. We have already discussed encapsulated probiotics, enzymes, and prebiotics that Brothers uses in all of their foods. They also use several amino acid compounds in their food – Lysine HCL, Taurine, and L-Carnitine. In general these compounds help build muscle, burn fat, and help utilize protein, but they also have functions such as helping heart and brain activity, among other things. DL-Methionine is another amino acid compound that is often added to pet foods to help with a pet’s urine. It can adjust the pet’s urine and keep it from burning the grass. It can also help to prevent struvite stones and crystals from forming. It’s found naturally in many kinds of fish and meat. The food also contains the usual vitamins and minerals, as well as some proteinated/chelated minerals for easier absorption. 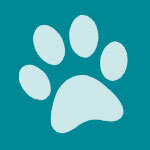 If you are interested, Brothers has a lot to say about detoxing dogs on their web site. We won’t go into all of it here but it makes for interesting reading, as do the answers to many of their Frequent Questions. Overall, we think this food looks very good. Note that all of three of the “with Advanced Allergy Care” formulas are very similar in terms of ingredients. The main differences are the primary proteins. Brothers Complete Lamb Meal & Egg Formula with Advanced Allergy Care contains 400 kcal/cup. This makes the food moderately high in terms of calories. *Please note that this is the actual statement on the Brothers Complete web site. It does say “turkey” and not lamb for this food. We assume this is just a typo since AAFCO typically approves all foods in a product line when it approves one. The dry matter basis (DMB) figures for this food are: protein 33.3 percent; fat 16.7 percent; fiber 4.4 percent; carbohydrates 36 percent. This food has above average protein and average or slightly above average fat compared to most super premium dog foods. The fiber content is average for most kibbles; and the carb percentage is moderate compared to many dog foods. We think that Brothers Complete Lamb & Egg with Advanced Allergy Care looks like a very good dog food. We particularly like the lamb, eggs, and turkey as the first three ingredients. The animal protein in the food looks very good. If you are looking for a dog food that does not contain grains or potatoes, this food has to rate very highly. Do be careful if your dog has allergies to some common food allergens such as eggs. Many people assume that their dogs are allergic to grains when they can be allergic to other ingredients in foods. Otherwise, this food is recommended and we think it has a lot of interesting features. Where can you buy Brothers dog food? You can buy Brothers Complete dog foods on Chewy.com and other online pet food sites. You can also check the Brothers web site to see where to buy their foods. Brothers is new to Chewy.com so you can be one of the first to write a review. Brothers is a family-owned, family-operated business that concentrates on producing the best possible dog food. They are using good quality ingredients AND paying attention to how those ingredients interact with each other. We really like the fact that they don’t just throw a bunch of ingredients together. They actually consider how ingredients work together in a food and how your dog responds to the food. Brothers Complete has only been making food for five years but we think they are doing a very good job. We’re excited to watch this brand develop. These are foods you should try. If you are transitioning your dog to Brothers Complete, please be sure to read their advice on the subject. You may need to take a little longer than usual to make this transition, especially if you have previously been feeding a dog food that contained grain or potatoes. IMO the only ingredients missing from Brothers Complete is Glucosamine. My dog is 13 years old and has arthritis. I noticed when I was feeding her Brothers her arthritis acted up. When my dog eats Acana her arthritis is fine. Maybe Brothers is not for senior dogs with arthritis? Thank You, I ordered a 25 pound bag of the Lamb and egg you told me just what I was looking for ! The only thing left is to see what Gomez thinks, Gomez said he is very excited but we will have to wait and see what he has to say, once his food arrives. I would like to comment on the awesome results I had, with Brothers Complete, not once but twice. I have a 6 and a half year old Black Lab. He had serious health problems as a pup. I fed him food he became allergic to. Red bumps, weight loss, refusing to eat, eyes that did not appear clear. Brothers Complete absolutely healed this dog, He continues to thrive to this day. His weight is perfect, I know he will be healthy with no joint problems as a result well into his senior years. Because he has never been over weight. My second dog, a mixed breed, recue. He also had skin problems. He had a hard early life, infested with fleas, raw spots and weight loss. A mess. Brothers Complete totally changed everything. These dogs now stay out of the vet, and I save money. But more important, loving them as I do, seeing thrive is worth everything for me. They are healthy happy amazing dogs. Check all of the ingredients, that Brothers Complete has, they are what your dogs need.